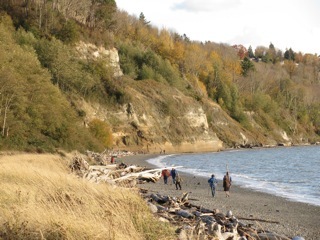 The Salish people, who lived on West Point for thousands of years, called this place Pka’dz Elue, for “thrust far out.” This is an apt name for the low point of land that extends westward into the deep waters of Puget Sound from Seattle’s Discovery Park. From its tip, one can look 20 miles north and south along the main basin of Puget Sound. West Point’s South Beach is a wonderful stretch of sand and gravel extending from Magnolia Bluff at its eastern end to the lighthouse at its western tip. Unlike Seattle’s more urban beaches, South Beach retains a natural character and a sense of remoteness from the city. This is a little surprising for a beach that was buried under riprap in the 1960s and that hosts the region’s largest sewage treatment plant, but it also says something about the resilience of beaches and changing public attitudes toward our shorelines. West Point is what geologists call a cuspate foreland, essentially the convergence of two spits, each built of sediment transported from eroding bluffs to the east. South Beach is the product of many centuries of landslides along two miles of Magnolia Bluff, Seattle’s most geologically spectacular neighborhood. These bluffs are now largely stabilized with drainage works and seawalls, but as recently as 1997 six homes slid to the beach. 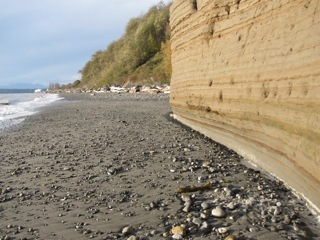 The only remaining source of sediment to this beach is a large, active landslide within Discovery Park itself. Like so many beaches, South Beach has a long and complicated story. 1100 years ago, a major earthquake on the Seattle Fault caused West Point to subside three feet. At the same time, beaches just a few kilometers south, on the other side of the fault, were raised twenty feet out of the Sound. The tsunami generated by the earthquake washed northward over West Point, leaving behind a telltale layer of sand on top of the old marsh and backshore surface. When European settlers arrived in the late 1800s, West Point looked much as it does today, except at that time there was also a tidal lagoon and salt marsh that drained on the north side. 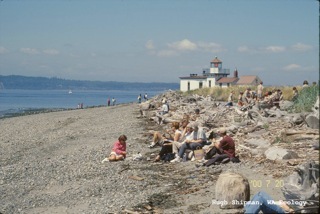 The Point became the site of a lighthouse and later of Fort Lawton. 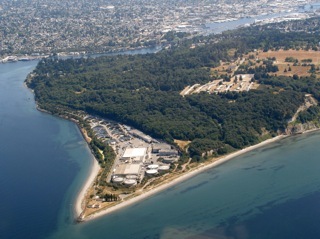 In the 1960s, Seattle chose West Point as the site of its new sewage treatment plant. The tidal lagoon was filled in, the plant constructed, and a large sewage pond, contained by a riprap dike, was built on top of South Beach. 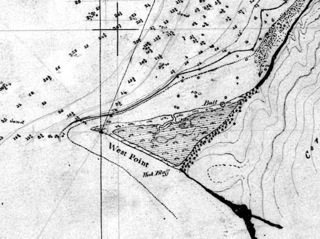 Times change quickly and in the 1970s the City obtained much of Fort Lawton and established Discovery Park. In 1980, when improvements were needed to the sewage plant, the city saw an opportunity to greatly enhance the beach within its newly created park. Guided by local outdoor legend and beach advocate, Wolf Bauer, the sewage pond and riprap were removed, the beach was nourished with sand and gravel, and the backshore restored and revegetated. Most visitors to this popular park probably don’t realize that the beach is nourished and restored, any more than they notice the hum of the pumps and digesters within the treatment plant screened behind the vegetated walls and landscape berms. Puget Sound’s beaches are a story of sand and gravel eroded from nearby bluffs and transported by longshore drift to hundreds of small spits and barrier beaches. 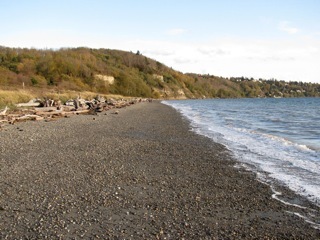 West Point is typical of these Puget Sound shorelines, with its mixed sand and gravel beach, piles of driftwood, and high, forested bluffs down to the water’s edge. A broad low-tide terrace extends far offshore before plunging to depths of over five hundred feet. There is an increasing awareness of the importance of these beaches in the larger Puget Sound ecosystem, but along with it is growing concern about the effects of past changes and the potential of future losses. Seawalls now armor almost one third of Puget Sound’s 2500 mile shoreline, cutting off sediment supplies and drawing a harsh line between terrestrial and marine environments. As on beaches everywhere, property owners build seawalls in large part to protect themselves and their property. The reality is that erosion rates on much of Puget Sound are slow and few homes are threatened, so much of this armoring is done as much to improve property as to preserve it. Unfortunately, addressing the long-term implications is both technically and politically challenging. Puget Sound is emblematic of a growing global understanding of sheltered coasts and estuarine beaches. These beaches have many of the same problems as ocean beaches, but haven’t always received the same level of attention.They are often highly diverse ecosystems and they represent much of the length of the world’s coastline. Many are in heavily urbanized regions, where the footprint of human activities is large and its legacy not readily erased. Puget Sound will experience incredible growth in the coming century and maintaining natural beaches in an emerging Pacific Rim megalopolis will be challenging. In our most urbanized areas, we may be able to create beaches and shoreline habitat, but doing so will be far more expensive and less sustainable than preserving the beaches we have. The prospect of higher sea levels will only make the challenges more pressing and more difficult.